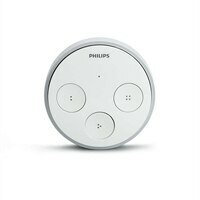 Philips Hue Tap Kinetic Powered SwitchEasily recall your four favorite light scenes or turn all lights on/off at the same time. The Tap switch is completely wireless and portable. Forget about batteries as the Tap switch is automatically powered when you press a button.